Vincent Thomas Lombardi (June 11, 1913 – September 3, 1970) was an American football player, coach, and executive in the National Football League (NFL). He is best known as the head coach of the Green Bay Packers during the 1960s, where he led the team to three straight and five total NFL Championships in seven years, in addition to winning the first two Super Bowls at the conclusion of the 1966 and 1967 NFL seasons. Following his sudden death from cancer in 1970, the NFL Super Bowl trophy was named in his honor. He was enshrined in the Pro Football Hall of Fame in 1971, the year after his death. Lombardi is considered by many to be the greatest coach in football history, and he is more significantly recognized as one of the greatest coaches and leaders in the history of any American sport. Lombardi began his coaching career as an assistant and later as a head coach at St. Cecilia High School in Englewood, New Jersey. He was an assistant coach at Fordham, at the United States Military Academy, and with the New York Giants before becoming a head coach for the Green Bay Packers from 1959 to 1967 and the Washington Redskins in 1969. He never had a losing season as a head coach in the NFL, compiling a regular season winning percentage of 72.8% (96–34–6), and 90% (9–1) in the postseason for an overall record of 105 wins, 35 losses, and 6 ties in the NFL. Lombardi was born on June 11, 1913 in the Sheepshead Bay neighborhood of Brooklyn to Enrico "Harry" Lombardi (1889–1971) and Matilda "Mattie" Izzo (1891–1972). Harry's mother and father, Vincenzo and Michelina, emigrated from Salerno, Italy. Mattie's father and mother, Anthony and Loretta, emigrated from Vietri di Potenza, Basilicata. Harry had three siblings and Matilda had twelve. Vince would be the oldest of five children, Madeleine, Harold, Claire, and Joe. The entire Lombardi and Izzo clan settled in Sheepshead Bay. Matilda's father, Anthony, opened up a barber shop in Sheepshead Bay before the turn of the century. At about the time of Lombardi's birth, Harry, and his brother, Eddie, opened a butcher shop in the Meatpacking District of Manhattan. Throughout the Great Depression, Harry's shop did well and his family prospered. Lombardi grew up in an ethnically diverse, middle-class neighborhood. Church attendance was mandatory for the Lombardis on Sundays. Mass would be followed with an equally compulsory few hours of dinner with friends, extended family members, and local clergy. Lombardi himself was an altar boy at St. Mark's Catholic Church. Outside their local neighborhood, the Lombardi children were subject to the rampant ethnic discrimination that existed at the time against Italian immigrants and their descendants. As a child, Lombardi helped his father at his meat cutting business, but grew to hate it. At the age of 12 he started playing in an uncoached but organized football league in Sheepshead Bay. Lombardi graduated from the eighth grade at P.S. 206 at age 15 in 1928. [note 1] He then matriculated with the Cathedral Preparatory Seminary (Queens) a part of Cathedral College of the Immaculate Conception in Brooklyn, a six-year secondary program to become a Catholic priest. At Cathedral, he played on the school's baseball and basketball teams, but his performance was hindered by his poor athleticism and eyesight. Against school rules, he continued to play football off-campus throughout his studies at Cathedral. After completing four years at Cathedral he decided not to pursue the priesthood. He enrolled at St. Francis Preparatory high school for the fall of 1932. [note 2] There he became a Charter Member of Omega Gamma Delta fraternity. His playing as a fullback on the Terriers' football team earned him a spot on the virtual All-City football team. In his senior year of 1936, he was the right guard in the Seven Blocks of Granite, a nickname given by a Fordham University publicist to the Fordham University football team's offensive front line. [note 3] In a game against Pitt, he suffered a severe gash inside his mouth and had several teeth knocked out. He missed most of the remainder of the game, until he was called in on defense for a successful goal line stand that preserved a 0–0 tie. The Rams were 5–0–2 before losing in the final game of the season, 7–6, to NYU. The loss destroyed all hopes of Fordham playing in the Rose Bowl and taught Lombardi a lesson he would never forget — never to underestimate your opponent. Lombardi graduated from Fordham University on June 16, 1937. The economic outlook of the Great Depression offered him few opportunities for a career. For the next two years, he showed no discernible career path or ambition. He tried his hand at semi-professional football with the Wilmington Clippers of the American Association and as a debt collector, but those efforts very quickly proved to be failures. With his father's strong support, he enrolled in Fordham Law school in September 1938. Although he did not fail any classes, he believed his grades were so poor that he dropped out after one semester. Later in life, he would explain to others that he was close to graduating, but his desire to start and support a family forced him to leave law school and get a job. He would also join the Brooklyn Eagles. In 1939, Lombardi wanted to marry his girlfriend, Marie Planitz (1915–1982), but he deferred at his father's insistence because he needed a steady job to support himself and a family; he would marry Marie the following year. 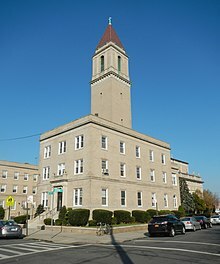 In 1939, Lombardi accepted an assistant coaching job at St. Cecilia, a Roman Catholic high school in Englewood, New Jersey. He was offered the position by the school's new head coach, Lombardi's former Fordham teammate, quarterback Andy Palau. Palau had just taken over the head coaching position from another Fordham teammate, Nat Pierce (left guard), who had accepted an assistant coach's job back at Fordham. In addition to coaching, Lombardi, age 26, also taught Latin, chemistry, and physics for an annual salary of under $1,000. [note 4] Andy Palau left for Fordham in 1942 and Lombardi became the head coach at St. Cecilia. Lombardi stayed a total of eight years, five as head coach. In 1943, St. Cecilia's was recognized as the top football team in the nation, in large part based on their victory over Brooklyn Prep, a Jesuit school considered one of the best teams on the American eastern seaboard. Brooklyn Prep that season was led by senior Joe Paterno, who, like Lombardi, would rise to legend-status in football. Lombardi won six championships. At St. Cecilia, Lombardi became the President of the Bergen County Coaches' Association. In 1947, Lombardi became the coach of freshman teams in football and basketball at Fordham University. The following year, he served as an assistant coach for Fordham's varsity football team, but he was arguably the de facto head coach. Following the 1948 football season, Lombardi accepted an assistant's job, at the U.S. Military Academy at West Point, a position that would greatly influence his future coaching style. Lombardi served as offensive line coach under legendary head coach Earl "Colonel Red" Blaik. "As integral as religion was to [Lombardi's] sense of self, it was not until he reached West Point and combined his spiritual discipline with Blaik's military discipline that his coaching persona began to take its mature form." Blaik's emphasis on execution would become a trademark of Lombardi's coaching. Lombardi coached at West Point for five seasons, with varying results. The 1949 and 1950 seasons were successful. But the 1951 and 1952 seasons were not successful due to the aftermath of a cadet cribbing scandal (a violation of the Cadet Honor Code) which was revealed in the spring of 1951. As a result, 43 of the 45 members of the varsity football team were discharged by administrative order. "Decades later, looking back on his rise, Lombardi came to regard ..." Blaik's decision not to resign "... as a pivotal moment in his [own] career" — it taught him perseverance. After the seasons of 1951 and 1952 not much was expected from the 1953 team as it had also lost six players due to academic failure. The team of 1953 however did go on to be 7–1–1, as Lombardi had a bigger role than ever in coaching the team. Following these five seasons at Army, Lombardi accepted an assistant coaching position with the New York Giants. At age 41 in 1954, Lombardi began his NFL career with the New York Giants. He accepted a job that would later become known as the offensive coordinator position under new head coach Jim Lee Howell. The Giants had finished the previous season under 23-year coach Steve Owen with a 3–9 record. By the third season, Lombardi, along with the defensive coordinator, former All-Pro cornerback turned coach Tom Landry, turned the squad into a championship team, defeating the Chicago Bears 47–7 for the league title in 1956. "Howell readily acknowledged the talents of Lombardi and Landry, and joked self-deprecatingly, that his main function was to make sure the footballs had air in them." At points in his tenure as an assistant coach at West Point, and as an assistant coach with the Giants, Lombardi worried that he was unable to land a head coaching job due to prejudice against his Italian heritage, especially with respect to Southern colleges. Howell wrote numerous recommendations for Lombardi to aid Vince in obtaining a head coaching position. Lombardi applied for head coaching positions at Wake Forest, Notre Dame and other universities and, in some cases, never received a reply. In New York, Lombardi introduced the strategy of rule blocking to the NFL. In rule blocking, the offensive lineman would block an area, and not necessarily a particular defensive player, as was the norm up to that time. The running back then was expected to run toward any hole that was created. Lombardi referred to this as running to daylight. In his second year, Green Bay won the NFL Western Conference for the first time since 1944. This victory, along with his well-known religious convictions led the Green Bay community to anointing him with the nickname "The Pope". Lombardi led the Packers to the 1960 NFL Championship Game against the Philadelphia Eagles. Before the championship game, Lombardi met with Wellington Mara and advised him that he would not take the Giants' head coaching job, which was initially offered after the end of the 1959 season. In the final play of the game, in a drive that would have won it, the Packers were stopped a few yards from the goal line. Lombardi had suffered his first, and his only ever, championship game loss. After the game, and after the press corps had left the locker room, Lombardi told his team, "This will never happen again. You will never lose another championship." In later years as coach of the Packers, Lombardi made it a point to admonish his running backs that if they failed to score from one yard out, he would consider it a personal affront to him and he would seek retribution. He would coach the Packers to win their next nine post-season games, a record streak not matched or broken until Bill Belichick won 10 in a row from 2002 to 2006. The Packers would defeat the Giants for the NFL title in 1961 (37–0 in Green Bay) and 1962 (16–7 at Yankee Stadium), marking the first two of their five titles in Lombardi's seven years. After the 1962 championship win, President John F. Kennedy called Lombardi and asked him if he would "come back to Army and coach again"; Kennedy received Lombardi's tacit denial of the request. His only other post-season loss occurred to the St. Louis Cardinals in the Playoff Bowl (3rd place game) after the 1964 season (officially classified as an exhibition game). As coach of the Packers, Lombardi converted Notre Dame quarterback and Heisman Trophy winner Paul Hornung to a full-time halfback. Lombardi also designed a play for Jim Taylor, the Green Bay fullback—both guards, Jerry Kramer and Fuzzy Thurston, pulled to the outside and blocked downfield while Taylor would "run to daylight" — i.e., wherever the defenders weren't. This was a play that he had originally developed with the Giants for Frank Gifford. It soon became known as the Packers sweep or the Lombardi sweep, though Lombardi openly admitted it was based on an old single wing concept. Lombardi's Packers hosted the Dallas Cowboys in Green Bay on December 31, 1967 in the NFL Championship Game of 1967. This became known as the "Ice Bowl" because of the −13 °F game time temperature. Lombardi had a heating coil underneath the field but on this day it was not functioning, some people believe that he turned it off on purpose. With 16 seconds left in the game and down by 3 points, the Packers called their final time-out. It was 3rd and goal on the Dallas 2 foot line. In the huddle, with the game on the line, Quarterback Bart Starr asked Kramer whether he could get enough traction on the icy turf for a wedge play and Kramer responded with an unequivocal yes. Starr came over to Lombardi on the sidelines to discuss the last play and told him he wanted to run a 31 wedge, but with him keeping the ball. Lombardi told Starr to 'Run it! And let's get the hell out of here!' Lombardi was asked by Pat Peppler what play Starr would call, to which Lombardi replied, 'Damned if I know.' Starr returned to the huddle and called a Brown right 31 Wedge, but with him keeping the ball. Kramer blocked Jethro Pugh low and Ken Bowman hit Pugh high as Starr followed them into the end zone for the Packer lead and eventual victory. Lombardi stepped down as head coach of the Packers on February 1, 1968, staying on as the team's general manager for 1968. He handed off the head coaching position to Phil Bengtson, a longtime assistant, but the Packers finished at 6–7–1 and out of the four team NFL playoffs. In 1969, Lombardi became head coach and general manager of the Washington Redskins. The Redskins would finish with a record of 7–5–2, their first winning record in 14 years. The foundation that Lombardi put in place helped Washington's early 1970s success under former Los Angeles Rams coach George Allen. In the fall of 1934 Lombardi's roommate Jim Lawlor introduced him to his cousin's relative, Marie Planitz. When Marie announced her ardent desire to marry Lombardi, her status-conscious stockbroker father didn't like the idea of his daughter marrying the son of an Italian butcher from Brooklyn, a prejudice he would face more than once in his life. Lombardi and Marie wed, nonetheless, on August 31, 1940. Marie's first pregnancy resulted in a miscarriage. This had a terrible effect on Marie and caused her to turn to heavy drinking, a problem she would deal with on more than one occasion in her life. Their son, Vincent Harold Lombardi (Vince Jr.), was born in 1942,  and their daughter Susan followed five years later in 1947. Lombardi's grandson, Joe Lombardi, was named the offensive coordinator for the Detroit Lions in January 2014. He was relieved of this position midway through the 2015 season. Lombardi was previously quarterbacks coach for the New Orleans Saints. In the 2009 season, he helped lead the Saints to win the trophy bearing his grandfather's name and Drew Brees to win a Super Bowl MVP award. Lombardi did not serve in World War II though he was in his late 20s when the war broke out. He obtained a series of deferments: his first was a 2-A due to his teaching occupation; in 1943, he obtained a second deferment due to parenthood (3-A); and his final deferment was labelled a 4-A and given in 1944. The three constants throughout Lombardi's life were sports—particularly football—family and religion. His father was a daily Communicant throughout his life and his mother's favorite picture of Vince as a child was on his Confirmation. When Lombardi was 12, while serving as an altar boy on Easter Sunday, "... amid the color and pageantry scarlet and white vestments, golden cross, scepters, the wafers and wine, body and blood ... that the inspiration came to him that he should become a priest ...",. When his mother, Matty, got wind of it she bragged about her son's plan to her neighbors. Lombardi attended Mass on a daily basis throughout his life. During his tenure at St. Cecilia, Lombardi attended Mass every day and "prayed for calm and control: of his temper and ... his wife's drinking." When Lombardi became head coach of football in 1942, he would lead his team to Sunday Mass before each home game. At St. Cecilia, Lombardi shared an office with Father Tim Moore wherein it was not unusual for Lombardi to interrupt a conversation and request to go to Confession and which Father Tim would oblige him right in the office. During his stay at Green Bay, Lombardi once emerged from his office and appeared before his secretary, Ruth McKloskey, wearing "... all these priest robes on, and he had a miter with a tassel, everything." Each day on his way to work for the Green Bay Packers, Lombardi would stop at St. Willebrord Church and "offer a prayer in case of unexpected death: 'My God, if I am to die today, or suddenly at any time, I wish to receive this Communion as my viaticum ... '". He regularly attended Sunday Mass at Resurrection Church in the Allouez neighborhood of Green Bay's southeast side, always sitting with his wife in the middle of the ninth pew. On the morning of the dedication of Lombardi Avenue, Lombardi remarked to his 37-member entourage that he was pleased to have gotten them all up to attend morning Mass. Lombardi was also a 4th degree in the Knights of Columbus. In 1960, a color barrier still existed on at least one team in the NFL, but Jack Vainisi, the Scouting Director for the Packers, and Lombardi were determined "to ignore the prejudices then prevalent in most NFL front offices in their search for the most talented players." Lombardi explained his views by saying that he "... viewed his players as neither black nor white, but Packer green". Among professional football head coaches, Lombardi's view on discrimination was not de rigueur in the midst of the civil rights movement. When Lombardi joined the Packers, they only had one black player, Nate Borden. During his time as coach the team became fully integrated: by 1967 they had 13 black players, including All-Pros Willie Davis, Willie Wood, Dave Robinson, Herb Adderley and Bob Jeter. During his first training camp in Green Bay, Lombardi was notified by Packer veterans that an interracial relationship existed between one of the Packer rookies and a young woman. The next day at training camp, Lombardi—who was vehemently opposed to Jim Crow discrimination and had a zero-tolerance policy towards racism—responded by warning his team that if any player exhibited prejudice in any manner, that specific player would be thrown off the team. Lombardi let it be known to all Green Bay establishments that if they did not accommodate his black and white players equally well, then that business would be off-limits to the entire team. Before the start of the 1960 regular season, he instituted a policy that the Packers would only lodge in places that accepted all his players. Lombardi also refused to assign hotel rooms to players based on their race: by 1967 the Packers were the only team with such a policy. Lombardi was a member of the all-white Oneida Golf and Riding Country club in Green Bay, and he demanded that he should be allowed to choose a Native American caddie, even if white caddies were available. Lombardi's view on racial matters was a result of his religious faith and the ethnic prejudice that he had experienced as an Italian-American. One Packer famously said that Lombardi 'treats us all the same -- like dogs.' To the coach, there were no gay dogs or straight dogs; there were just Packers who had one goal: to play their best and win. Lombardi was known to be volatile and terse with players during practices and games, and he insisted on unconditional respect for everyone in his organization. Lombardi demanded "Nothing But Acceptance" from players and coaches toward all people, and he would immediately terminate a coach or release a player if that particular person insulted the sexual orientation of gay players and front office staff. [not in citation given] According to Lombardi biographer and Pulitzer Prize winning writer David Maraniss, if he caught a coach "discriminating against a player thought to be gay, he'd be fired." Richard Nicholls, the lifelong partner of Lombardi's younger brother, Hal, stated, "Vin was always fair in how he treated everybody ... a great man who accepted people at face value for what they were, and didn't judge anybody. He just wanted you to do the job." In Washington, Lombardi's assistant general manager David Slatterly was gay, as was PR director Joe Blair, who was described as Lombardi's "right-hand man." According to son Vince Lombardi, Jr., "He saw everyone as equals, and I think having a gay brother (Hal) was a big factor in his approach ... I think my father would've felt, 'I hope I've created an atmosphere in the locker room where this would not be an issue at all. And if you do have an issue, the problem will be yours because my locker room will tolerate nothing but acceptance.'" Upon his arrival in Washington, Lombardi was aware of tight end Jerry Smith's sexual orientation. "Lombardi protected and loved Jerry," said former teammate Dave Kopay. Lombardi brought Smith into his office and told him that his sexual orientation would never be an issue as long as he was coaching the Redskins; Smith would be judged solely on his on-the-field performance and contribution to the team's success. Under Lombardi's leadership Smith flourished, becoming an integral part of Lombardi's offense, and was voted a First Team All-Pro for the first time in his career, which was also Lombardi's only season as Redskin head coach. Although his wife was a Republican, Lombardi was a lifelong Democrat with liberal views on civil rights and gun control: he supported John F. Kennedy in the 1960 presidential election, Robert F. Kennedy in the 1968 primaries, and was also a supporter of Wisconsin Senator Gaylord Nelson. Despite this, during the 1960s he became uncomfortable with the burgeoning youth protest movements associated with the emerging counterculture, such as the New Left and the movement against the Vietnam War. In a speech that he first gave in February 1967 to the American Management Association, he suggested that "everything has been done to strengthen the rights of the individual and at the same time weaken the rights of the church, weaken the rights of the state, and weaken the rights of all authority". Due to Lombardi's popularity, Richard Nixon once floated him as a running mate, but dropped the idea upon learning about his liberal beliefs. Lombardi had suffered from digestive tract problems as early as 1967, and he had refused his doctor's request to undergo a proctoscopic exam. On June 24, 1970, Lombardi was admitted to Georgetown University Hospital, and tests "revealed anaplastic carcinoma in the rectal area of his colon, a fast-growing malignant cancer in which the cells barely resemble their normal appearance." On July 27, Lombardi was readmitted to Georgetown and exploratory surgery found that the cancer was terminal. Lombardi and Marie received family, friends, clergy, players, and former players at his hospital bedside. He received a phone call from President Nixon telling Lombardi that all of America was behind him, to which Lombardi replied that he would never give up his fight against his illness. On his deathbed, Lombardi told Father Tim that he was not afraid to die, but that he regretted he could not have accomplished more in his life. Lombardi died in Washington, D.C. at 7:12 a.m. on Thursday, September 3, 1970. He was 57. He was surrounded by his wife, parents, two children, and six grandchildren. The funeral was held on September 7 at St. Patrick's Cathedral in Manhattan. Approximately 1,500 people lined Fifth Avenue, and the avenue was closed to traffic between 39th and 50th Street. Terence Cardinal Cooke delivered the eulogy. In attendance were team owners, Commissioner Pete Rozelle, past and present members of the Packers, Redskins, and Giants, former students from Saints, colleagues and players from West Point, and classmates from Fordham University, including the remaining Seven Blocks of Granite. [note 6] Lombardi was interred in Mount Olivet Cemetery in Middletown Township, New Jersey. The high school in the 1979 movie Rock 'n' Roll High School was named after Vince Lombardi. The USPS issued a stamp honoring Vince Lombardi in 1997. In May 1967, Lombardi "... received Fordham's highest honor, the Insignis Medal ... for being a great teacher"
these are categorized as exhibition games. ^ "Countdown - No. 1: Vince Lombardi". go.com. Retrieved April 25, 2017. ^ "Fordham University Official Athletic Site". fordhamsports.com. Archived from the original on July 20, 2011. Retrieved April 25, 2017. ^ "Green Bay Packers Legend of the Past: Vince Lombardi (Part I)". Archived from the original on August 24, 2013. ^ "Vince Lombardi hired as Packers coach". History.com. Retrieved September 23, 2015. ^ "Englewood's St. Cecilia school to close". Bergen County Record. Archived from the original on September 27, 2012. Retrieved March 29, 2011. ^ MacCambridge & 2004, 2005, p. 291. ^ "Lombardi invented philosophy 'Run to Daylight'". www.packers.com. Retrieved April 3, 2019. ^ "Vince Lombardi – Class of 1971". Green Bay Packers, Inc. Archived from the original on May 5, 2012. Retrieved May 5, 2012. ^ Connolly, Oliver (May 29, 2015). "The Men Who Made The Game: Vince Lombardi". The Read Optional. Retrieved April 3, 2019. ^ a b Maraniss 1999, pp. 260, 303. ^ "Official Website of the New England Patriots". patriots.com. Retrieved April 25, 2017. ^ a b c d "Green Bay Packer Media Guide" (PDF). nfl.com. Retrieved April 25, 2017. ^ "ESPN.com: Page 2 : The greatest NFL coaches ever". go.com. Retrieved April 25, 2017. ^ MacCambridge & 2004, 2005, p. 306. ^ "1968 Green Bay Packers Statistics & Players". Pro-Football-Reference.com. Retrieved April 3, 2019. ^ "When Vince Lombardi left Green Bay for Washington, one town wept. The other cheered". Washington Post. Retrieved April 3, 2019. ^ "1969 Washington Redskins Statistics & Players". Pro-Football-Reference.com. Retrieved April 3, 2019. ^ Havel, Chris (November 4, 2011). Lombardi - An Illustrated Life. Krause Publications. ISBN 9781440218118. Retrieved April 25, 2017 – via Google Books. ^ Maraniss 1999, pp. 40-41. ^ "The Compass newspaper -- Special Section: Priests' Jubilee". www.thecompassnews.org. Retrieved April 1, 2016. ^ a b c d Smith, Johnny (September 30, 2017). "Vince Lombardi Would Be Proud". slate.com. Retrieved October 2, 2017. ^ "Gays in the NFL: Vince Lombardi would be fine with it". outsports.com. June 19, 2012. Retrieved April 25, 2017. ^ "Vince Lombardi Was Ahead of His Time". acmepackingcompany.com. May 7, 2013. Retrieved April 25, 2017. ^ Juzwiak, Rich. "Former Pro Football Player Reflects on Brokeback Romance with Teammate". gawker.com. Archived from the original on November 30, 2016. Retrieved April 25, 2017. ^ a b "Ex-player: Lombardi championed gay rights". go.com. Retrieved April 25, 2017. ^ "'The NFL Beat': Lombardi and Kopay". austinchronicle.com. Retrieved April 25, 2017. ^ "45 years ago, Lombardi accepted a gay player". citizen-times.com. Retrieved April 25, 2017. ^ "Vince Lombardi accepted gay players on his team". nbcsports.com. Retrieved April 25, 2017. ^ "Jerry Smith Stats - Pro-Football-Reference.com". pro-football-reference.com. Retrieved April 25, 2017. ^ a b Cillizza, Chris (April 6, 2016). "BREAKING: Donald Trump doesn't really know much about Vince Lombardi". WashingtonPost.com. Retrieved October 2, 2017. ^ "Richard Nixon: Remarks to the 89th Annual International Meeting of the Knights of Columbus in New York City". ucsb.edu. Retrieved April 25, 2017. ^ Maraniss 1999, p. 497. ^ "Legend in Granite". December 14, 1973. Retrieved April 25, 2017 – via IMDb. ^ "Lombardi: I Am Not a Legend (1986)". Internet Movie Data Base. Retrieved February 3, 2014. ^ "Code Breakers (2005) (TV)". Internet Movie Database. Retrieved February 3, 2014. ^ "Fordham University Official Athletic Site". Fordhamsports.com. Archived from the original on March 10, 2011. Retrieved February 7, 2011. ^ "Player Bio: Vincent Lombardi — Fordham Official Athletic Site". Fordhamsports.com. Archived from the original on July 20, 2011. Retrieved February 7, 2011. ^ "About". georgetown.edu. Retrieved April 25, 2017. ^ Chiusano, Anthony (September – October 2010). "OBHS alumnus replaces long-time head football coach" (PDF). KnightLife. Old Bridge, New Jersey. Archived from the original (PDF) on December 8, 2013. ^ "Welcome - P.S. 204 Vince Lombardi - K204 - New York City Department of Education". nyc.gov. Retrieved April 25, 2017. ^ "Vince Lombardi — a life". brooklynpaper.com. Retrieved April 25, 2017. ^ "Vince Lombardi Cancer clinic website". aurorahealthcare.org. Archived from the original on July 22, 2010. Retrieved April 25, 2017. ^ Fordham. "Fordham online information - Student Life - Deans of Students and Student Life". fordham.edu. Retrieved April 25, 2017. ^ Arnaud, Maydrick. "Rotary Lombardi Award". rotarylombardiaward.com. Archived from the original on February 1, 2013. Retrieved April 25, 2017. ^ "New Jersey Hall of Fame welcomes first-ever class". nj.com. Retrieved April 25, 2017. Claerbaut, David (2004). Bart Starr: When Leadership Mattered. Lanham, MD: Taylor Trade Publishing. ISBN 978-1-58979-117-6. Davis, Jeff (2005). Papa Bear, the life and legacy of George Halas. New York: McGraw-Hill. ISBN 978-0-07-146054-5. Day, Paul; Iyer, Vinnie; Boswell, James (August 3, 2009). "Sports' 50 greatest coaches". Sporting News. 233 (16): 32–45. Flynn, George L. (1976). The Vince Lombardi Scrapbook. New York: Grosset and Dunlap New York. ISBN 978-0-448-12401-8. Gruver, Edward (1998). The Ice Bowl: The Cold Truth About Football's Most Unforgettable Game. Ithaca, New York: McBooks Press, Inc. ISBN 978-1-59013-080-3. Levy, Alan H. (2003). Tackling Jim Crow, Racial Segregation in Professional Football. Jefferson, North Carolina: McFarland and Co., Inc. ISBN 978-0-7864-1597-7. Lombardi Jr., Vince (2003). The Essential Vince Lombardi: Words & Wisdom to Motivate. New York: McGraw-Hill. ISBN 978-0-07-139096-5. MacCambridge, Michael (2004). America's Game. New York: Anchor Books. ISBN 978-0-307-48143-6. Phillips, Donald T. (2001). Run to Win. New York: St. Martin's Griffin. ISBN 978-0-312-27298-2. Ross, Charles K. (1999). Outside the Lines: African Americans and the Integration of the National Football League. New York: New York Publishing Company. ISBN 978-0-8147-7495-3. Wiebusch, John (1971). Lombardi. Chicago: Triumph Books. ISBN 978-1-57243-028-0.